While many have heard the music of Johnny Cash, few know the whole story behind his extraordinary career and the stories of those who helped him attain his success. Marshall Grant, Cash's longtime bassist and one of the founding members of Johnny Cash and the Tennessee Two, chronicles their rise to fame from humble beginnings to world renown. The genesis for I Was There When It Happened was a rousing speech by Grant during the nationally televised memorial service for Johnny Cash. After receiving multiple standing ovations, he was approached by several people, including Cash's family and former Vice President Al Gore, to consider writing a book. The result is a touching, revealing, and inspiring memoir about the Man in Black. Beginning with Grant and guitarist Luther Perkins's initial introductions to Johnny Cash and the jam sessions that followed, readers will marvel at how their musical inabilities, as much as their abilities, drove these three men to musical greatness. 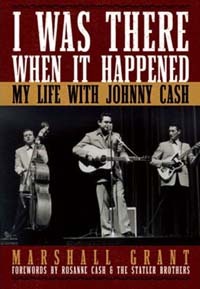 From Grant's humorous story of placing adhesive tape on his bass to learn the notes prior to landing their Sun Records recording contract and witnessing Johnny write "I Walk The Line", to his experience of playing with CAsh at Folsom Prison, readers are taken backstage into Cash's inner circle. "Johnny Cash was the greatest human being to ever walk the face of the earth," writes Marshall Grant. While Grant and Cash experienced remarkable success in their careers, their most profound success was an enduring friendship until Cash's dying day. Through the good and the bad—and there were plenty of both—Marshall Grant shares how John and he "walked the line" for each other and for those around them. I Was There When It Happened is a testimony to friendship and to the unique qualities behind one of the most respected and beloved entertainers of all time. Marshall Grant played bass and served as road manager and stage manager for Johnny Cash from the beginning until 1980. Following his career with the Man in Black, he managed the Statler Brothers until their retirement in 2004 and currently manages the solo career of Statler Brother Jimmy Fortune. He lives in Hernando, Mississippi with his wife, Etta. Chris Zar is a longtime friend of the author who, with her husband, Al, promoted Statler Brothers concerts for fifteen years.